Ananth Gudipati leads the digital strategy at the Farm to Market Alliance (ftma.org) – “A multi stakeholder demand-based consortium set up to develop various food crop value chains.” He has been engaged in the agriculture sector for more than a decade and has deep experience in agriculture supply chains and ICT for agriculture in Asia and Africa. He is also the co-founder of Coolify – a mobile-enabled micro cold storage firm in South Asia, and he advises iprotech – an IOT firm for aquaculture farmers. 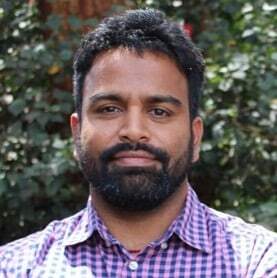 Previously, Ananth was a strategy consultant and had stints with TechnoServe and Dalberg consulting, leading their agriculture and SME projects. He also worked on the Stanford University/RDVP-led “Computer on Wheels” project and was responsible for launching multiple ICT-based information modules, including localized agriculture price data portals. He holds an Engineering and Masters degree in telecommunication and business. Discussion of digital agriculture innovation often focuses on buzzworthy technologies like the internet of things, artificial intelligence and blockchain. But though these technologies will eventually define the future of the sector, Ananth R Gudipati at the World Food Programme and Paul Kweheria at Mercy Corps say we should start with the basics – getting farmer organizations and SMEs to use digital tech to streamline their operations. They share insights from a digital platform developed by the Farm to Market Alliance that’s doing just that.